The evergreen conifer Norway spruce (Picea abies) grows approximately 100 feet in height. The branches of the tree droop slightly in a weeping fashion. The root system of the tree grows close to the soils surface which makes growing grass or other plants around the Norway spruce difficult. 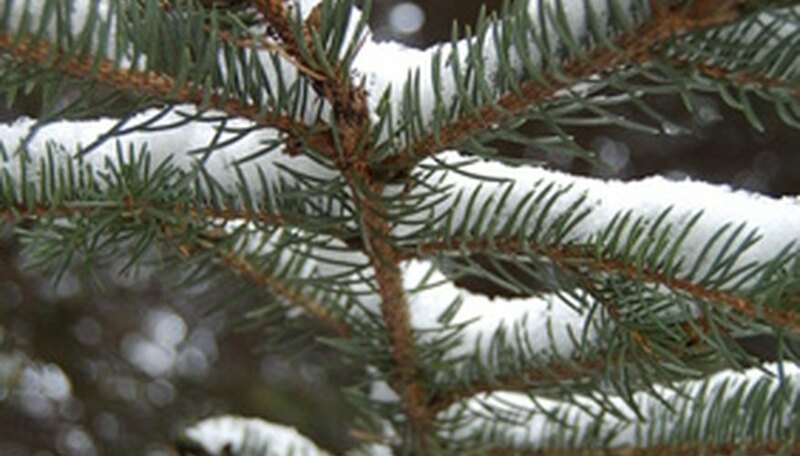 The tree is commonly grown as an ornamental, windbreak, screen or Christmas tree. A native North American tree, the Norway spruce is hardy, adaptable and disease resistant. It thrives in USDA Zones 3 to 7. Plant the Norway spruce in a location that offers well-draining soil that is slightly acidic. The Norway spruce adapts to a wide range of soil and will grow well in clay or sandy loam but it prefers rich, organic soil. The tree will not tolerate standing water around its root system. Choose a spot for the Norway spruce in full sunlight for maximum growth. The tree will tolerate partial shade but its growth will be slowed. Place abundant mulch around the tree to keep weeds down and also help the soil retain moisture in the heat of summer. Apply 2 to 4 inches of peat moss, leaf debris or bark chip mulch around the trees base. Water the Norway spruce regularly so the soil stays moist. It should never be water-logged but it enjoys moist soil conditions. Apply a dormant horticultural oil spray in the late winter or early spring before the Norway spruce tree shows signs of new growth. A horticultural oil spray will control spruce spider mites (Oligonychus ununguis). Fertilizing the Norway spruce tree can often encourage the tree to prolong its growing cycle and then the tree will easily become frost damaged in cold weather.